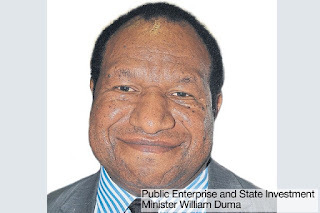 Papua New Guinea's Minster for Public Enterprise and State Investment William Duma says Cabinet has decided to merge the three telecommunications companies under one umbrella and a new managing-director has been recruited. Duma told The National that new managing director Paul Hyde started work last month. “We have Telikom mobile company with 4G network and BMobile, an older mobile company with 3G networks, so we are making it in such a way that they become one mobile company. Meanwhile, Duma said the merger for Water PNG and Eda Ranu was progressing well with Raka Taviri taking charge of both companies. “We have amendments that will come before Parliament, hopefully in the next sitting,” he said. Since the approval by Cabinet last year, the two entities started the merger process. Water PNG operated on the Water and Sanitation Act 2016 while Eda Ranu operated on the NCD Water Supply and Sewerage Act 1996.